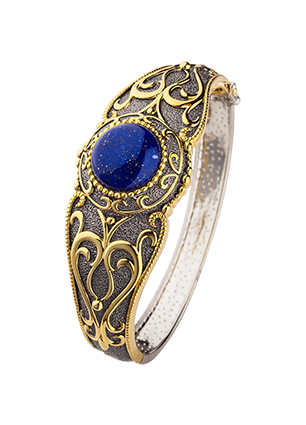 A silver bracelet with gilded patterns around dark-blue lapis, a blue the colour of an Oriental night sky. Wondrous Arabian fairy-tales as narrated by European jewellers. It goes with a long evening dress or a informal blazer.